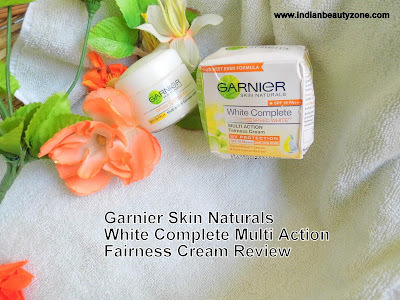 Garnier Skin Naturals White Complete Multi Action Fairness Cream with SPF 19 PA+++ , speed white serum is a blend of actives that address skin moisture and fairness needs. Pure Lemon essence known to clarify and smoothens skin. UV filters known to protect your skin from further darkening by harmful UVA and UVB rays. 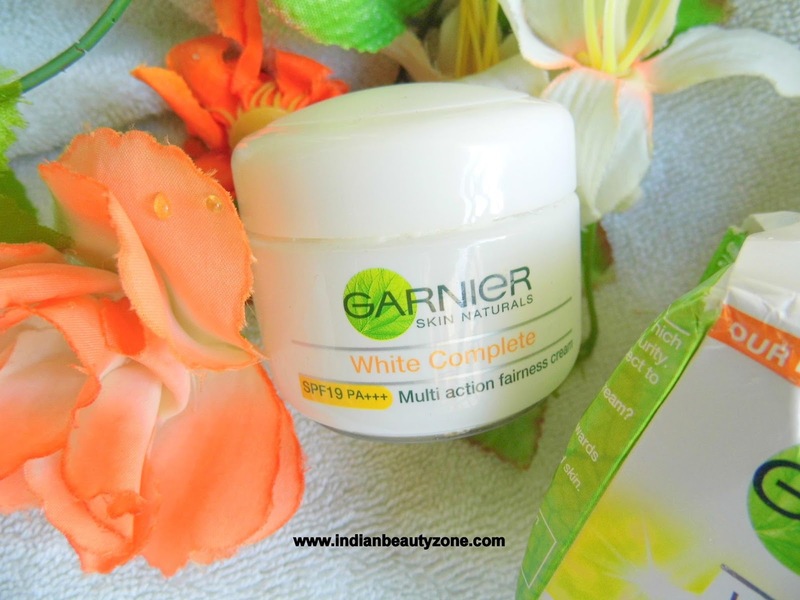 Enriched with natural ingredients, this formula provides instant whitening and long lasting fairness. Your skin looks even, feels fresh and moisturized with a natural glow. This fairness cream comes in a small white plastic tub with screw open lid, inside there is a plate like lid to prevent the spillage of the cream into the lid. The Small tub is ok for travel purpose, still I feel it should come in a tube like the face wash from this range, so that the hygiene purpose for the skin can be maintained. The texture of the cream is creamy and milky white in colour. It smells like lemon flower, because I am familiar to those tiny lemon flowers smell, I can easily recognize it. 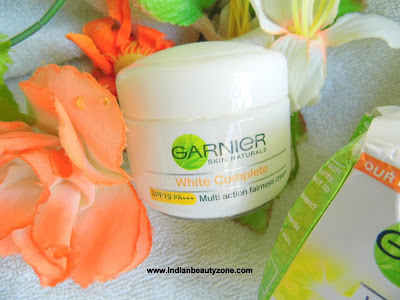 I have started using it and I have never tried any Garnier skin creams before this cream. But I have used the same face wash of Garnier already during my college days. When I started using it my oily sensitive skin started to give reactions like tiny pimples and more oiliness. For three days these problems was troubling me. I was thinking to give up this cream and still felt ok to try few more days. For my surprise those oiliness and tiny pimples are gone and this cream started to behave well with my skin. I feel smooth and glow skin until I wash my face next time. This cream makes the skin visibly brighter and even after applying. It takes five minutes to settle down into the skin though it is light in texture. It get absorbed easily into the skin and you will need very small amount of cream for each time use. Now this cream has become my favorite day cream and I use to apply this cream during morning time without fail, it has SPF 19 PA protection gives me extra comfort to face indoor sunshine. Over all this cream does what i claims like gives visibly bright and even skin, it hydrates the skin well, also it keeps the skin soft and glow all the day. Best day cream for all skin types. Act as best moisturizer as well as a fairness cream. Light in texture with awesome smell. Makes face fresh and glow. I really want this cream in tube, so that it will be hygeine to handle and more travel friendly. Initially you may feel it is not suitable, but do try it for a week to see the original results.